June 14, 2016 | By Full Sail Brewing Co.
Bon voyage boring beer. Full Sail’s new Brewmaster Reserve Capsize Imperial Pilsner is hitting the shores, or at least the shelves, for the summer. Capsize has intense aromas of pine and citrus balanced by a full malty body and a long, clean, hoppy bitterness. 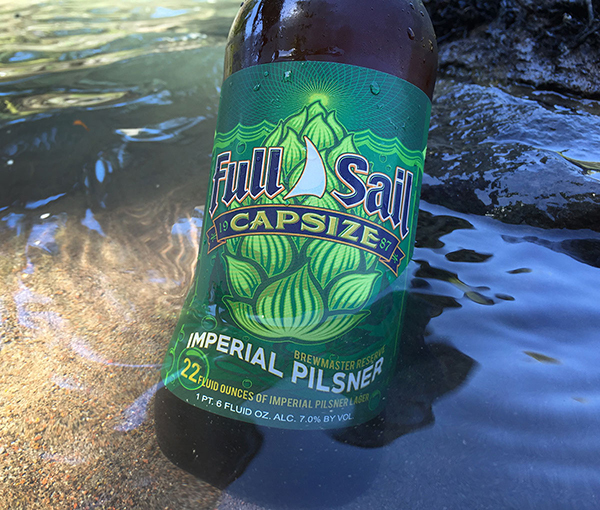 Building on its award-winning Cascade Pilsner, Full Sail’s new, dry-hopped Capsize Imperial Pilsner delivers even more Northwest hoppiness and summer happiness. Capsize is an aromatic hoppy delight. Its clean malt profile, well balanced with moderate bitterness, sets the stage for a blend of Cascade, Crystal and Citra hops to provide a spicy Northwest backbone to the full-bodied golden lager. 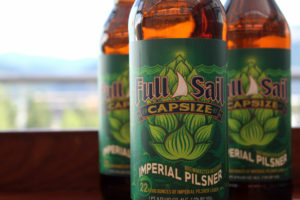 Capsize Imperial Pilsner is similar in style to the Full Sail brew with the same name from the early 2000s, but is brewed with a completely new recipe. Paired with burgers, steaks, BBQ, or spicy desserts like ginger bread and carrot cake, Capsize is the perfect brew to serve at summer dinners with friends. Capsize also pairs well with Roquefort, Stilton, Camembert, Taleggio and aromatic and pungent aged cheeses. Full Sail’s Brewmaster Reserve series allows the brewmasters to put their creativity, innovation and passion into small, limited-release beers. These craft brews highlight the direct connection with Full Sail’s farmers, celebrate the art of barrel aging, and explore the effects of time. Over the years, Full Sail’s Brewmaster Reserve series has earned 18 gold medals. Brewmaster Reserve Capsize Imperial Pilsner is available June through October in 22 oz. bottles and draft. 7% ABV, 60 IBU.